Anatolia has great food and such a wonderful change for Playa. It's nice to have some variety to choose from and the food is very good. REAL turkish food taste. Sooo goood! This restaurant definitely reminded me Turkey. The first time I went to this restaurant I wanted to test it. In my opinion, the best way to know if you're sitting in a good turkish restaurant it's by eating döner in its simplest way. So I tried just a bread filled with döner and it was reaaally good, they managed to find the perfect balance between the lamb and the beef. They offered me a garlic sauce that was very tasty as well, but I don't like adding that amazing sauce to the amazing döner because I think that it overshadows the meat's taste. I also tried hummus and it was with this super smooth consistency and a great flavor. So I decided that I was gonna turn back one day, and so I did! So the second time I visited this restaurant I ordered Iskender. This is a dish that I looove (probably my favorite turkish dish) and I was not disappointed, it was very very good. 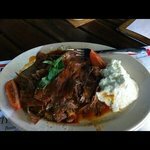 I do have to warn people that Iskender it's quite heavy, it has bread covered with a tomato and butter sauce and over it, döner's meat with this smoky flavor and yogurt on the side, so some people can find it too soggy, but that's kinda the thing that I like about the dish. And for dessert I ordered sütlaç (I'm kinda shy to say this, but I ate TWO -what can I do?! it was very good! ), that's it's the turkish version of rice with milk (arroz con leche) but baked in the oven and no cinnamon added to the preparation (just at the top for decoration) and it's served in a clay plate that gives this i-don't-know-what super tasty flavor. And at the end the chef offered me and my friend turkish tea (just like Turkey!!) and it was a very nice detail and a very nice tea. The third time I went I asked for durum, that was also good. Overall this restaurant it's very good, the chef is so charming and kind, and the staff it's very willing to please and solve your discomforts (if there are any). It's not as cheap as I would like, but definitely not expensive, there is turkish music playing, everything it's very clean (very important for me cuz I'm quite picky =P) and it's Turkey's real flavor. I do recommend this place and for sure I will turn back. Finally, a good Turkish restaurant in Playa. For appetizers share different plates and as a main course, I recommend the dish with all types of meat, quite tasty. Unfortunately, when we went they had yet to offer a selection of wines, but they said that this was coming shortly. The service was attentive and very good. I will definitively go back. Been to Anatolia? Share your experiences!